News: New Coca-Cola Mini Out This Month? 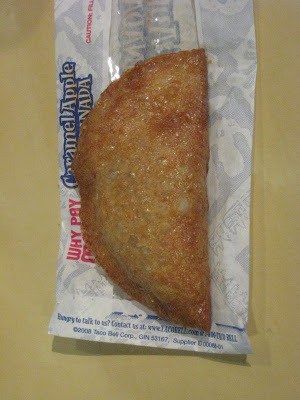 A cross between a baked and deep-fried apple pie, Taco Bell's Caramel Apple Empanada sells for 99 cents off of Taco Bell's "Why Pay More" Menu. Shaped a bit like those Hostess pies at the supermarket, the Caramel Apple Empanada is for those who can't decide between a baked apple pie and a deep-fried one. 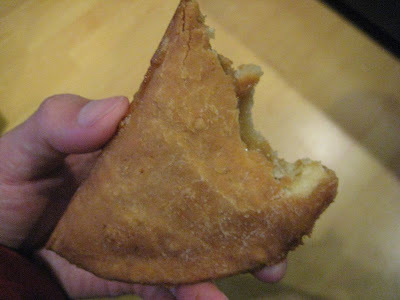 You see, the Caramel Apple Empanada offers both: one half is deep-fried crispy with little air bubbles in the dough and the other half is baked with a normal pie crust texture. As the name states the filling does have a bit of a caramel flavor to it that I find a bit too sweet. 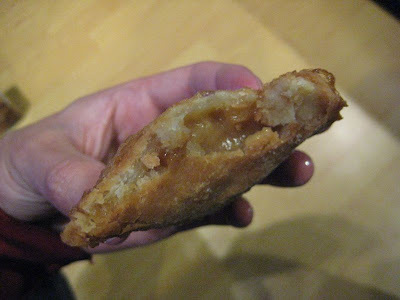 While it may be a bit too much caramel sweetness for some such as myself, Taco Bell's Caramel Apple Empanada does offer the interesting contrast between two differing crusts and a gooey apple filling for a cheap price. how does the taste compare to mcd apple pie? Hm... I'm not so sure I like the caramel flavor... I'm not a fan of caramel apples either... only candied ones! So I have to say for that reason that I prefer McDonald's Apple Pie. this is like if a mcdonalds apple pie and a churro had a baby. mmn'elicious! Two hot from the packet, in a bowl with vanilla ice cream. Heaven.